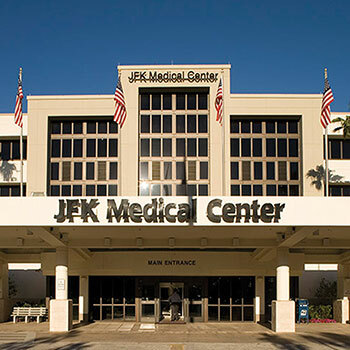 JFK Medical Center, originally named John F. Kennedy Hospital as the first memorial to our nation’s 35th president, was founded in 1966 as a community hospital. Today, JFK Medical Center has evolved into a 472-bed acute care medical and surgical facility known for our comprehensive services including 24-Hour Emergency Services, Cardiovascular Care, Cancer Care, Breast Care, Neurosciences, Stroke Care, General, Minimally Invasive & Robotic Surgery, Orthopedic Care, Spine Care, Bariatrics, Sleep Disorders, Wound Management, Behavioral Health and Obstetrics. We are pleased to continue to receive recognition as a quality hospital with our designations by the Joint Commission as a certified primary stroke center, as well as being recognized as one of the 2014 and 2015 Truven Health Top 50 Cardiovascular hospitals in the Country. This prestigious annual award honors hospitals that have led the way with superior performance in cardiovascular service in four key areas: outcomes of care, service-line efficiency, financial performance, and core measures alignment. JFK Medical Center is committed to providing quality, cost-effective healthcare to the communities we serve. Our level of service and team of professionals rank among the best in the nation, with over 600 physicians, 2,000 healthcare professionals and 250 volunteers.